Today I have a fun, colourful quilted baby mat pattern for you to download. Given the star motif I’m calling the pattern When You Wish… (thank you, Walt Disney). I don’t often buy fat quarter bundles – I’m a half yard stasher (sometimes a full yard stasher). But when I was offered the chance to sew with a fat quarter bundle of Karen Lewis’ Blueberry Park for Robert Kaufman, I jumped at the chance. 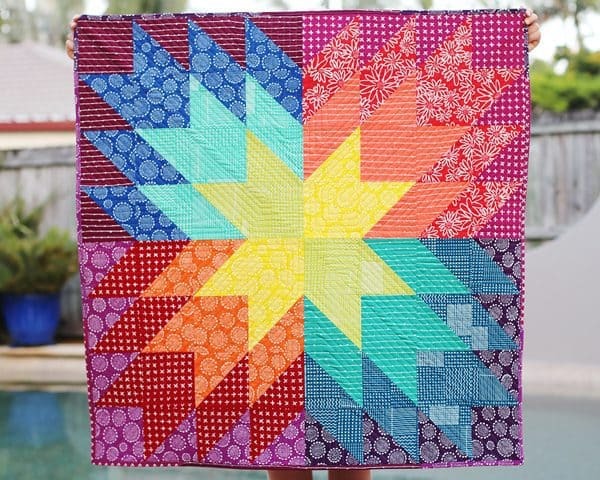 This pattern is perfect for a quilting beginner, made with squares and half square triangles (HSTs). I divided the colours of Blueberry Park into warm and cool palettes and assigned them to each of the four quadrants. 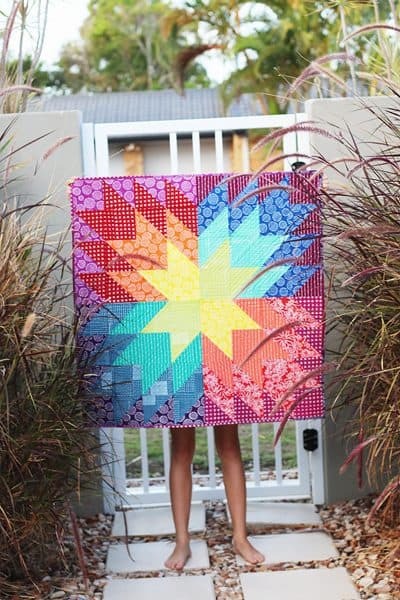 Quilts with legs: my new favourite. When You Wish… measures 36.5″ x 36.5″. 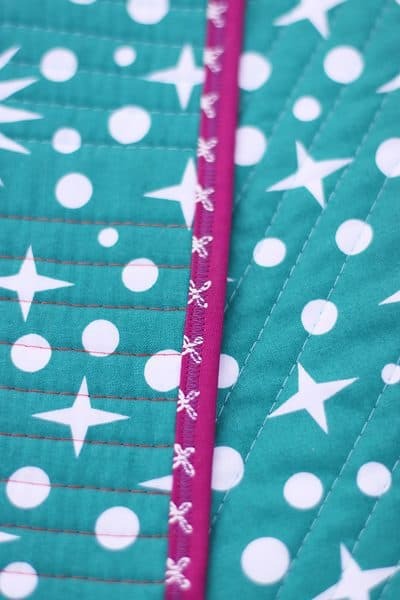 I love this width for a baby quilt as it can be backed with a single stretch of yardage. 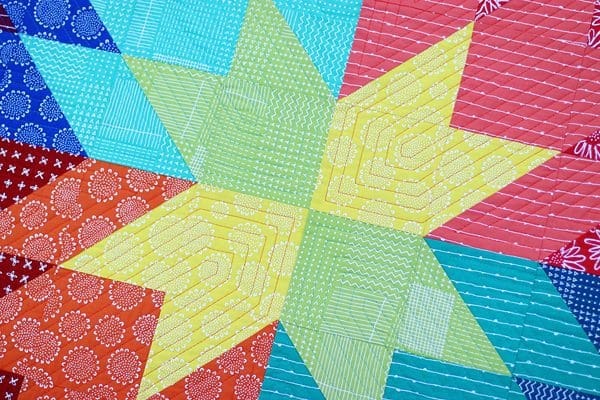 I had fun quilting this one – the warm quadrants were quilted with tangerine thread, the cool quadrants with aqua. I used the patchwork seams and the edge of my walking foot – no guide lines were drawn. When my needle is in the centre position it measures a half inch from the edge of my walking foot. When I was close to my pivot point I used a small ruler to check for the spot where I was a half inch from the next patchwork line. I would sew up to that spot and then pivot. Sometimes I was a little over or under (which happens when your stitch length is long, as it is when you quilt); I would just adjust the next line to account for that discrepancy. It was all very much by eye and by feel – nothing stressful about it at all. Above you can see how I quilted each quadrant. These were the first lines and then I filled each portion in with lines that echoed them. I backed When You Wish… with some leftover Elizabeth Hartman wideback (in Ultra Marine). I love how quick, easy and forgiving this method of binding is. And it’s so robust for a baby mat which will receive copious amounts of poo, spew and washings. But I suspect that will wash out once it has it’s first bath. Regardless, it’s not enough of a worry to stop me from using this method again. Sometimes, you’ve just gotta get her done. 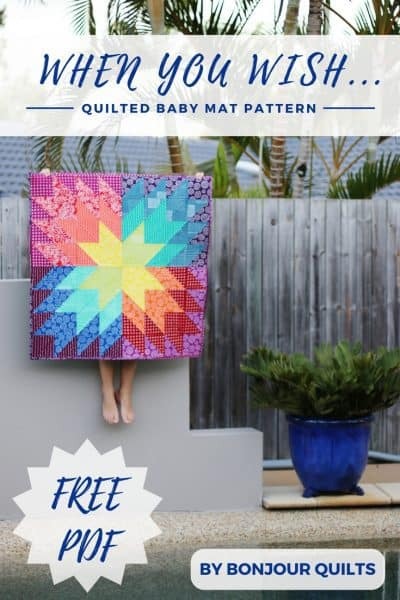 If you know of a little star who needs a baby quilt, I hope you will make them a When You Wish… Baby Mat! Love this!!!! And especially loved how you quilted it!!! so pretty….I tried to get the pattern but its says I must enter a valid email….well I only have one email and it is valid…what do I do? Are you happy for me to try and get the email program to send it to you from my end? I have tried to obtain the pattern for this quilt and it is just not being sent. Is there another way to obtain it? Thank you. I’m sorry you’re having trouble. Did you get the confirmation email once you had entered your details? It might have gone to your spam folder. If you did get the confirmation email, you need to click the confirmation button and then you’ll receive the pattern. Some people find that their computer downloads the file and then hides it away in their “downloads” folder – so it’s worthwhile getting into your file manager and having a look there too. Good luck – let me know if you still don’t have the pattern and I will figure out another way to get it to you. ça va arriver, tout de suite! Hi Kirsty. I cannot get the pattern eitjer2. It is not in my inbox, or my spam filter, or junk email. Hi Kirsty. I cannot get the pattern either. I love this quilt! My thought….I need to buy a fat quarter bundle, because I NEVER buy them!!! Thanks Kirsty for sharing this one! Oh, so pretty. I’m saving this and I want to make it x 4 for a throw! Thank you. Love how bold and bright this is. When you did the quilting without going through the exact center did it cause the quilt to want to pucker up in the center. It doesn’t look like it did but i did some quilting like this once and it putched up in the center. No, no bunching in the very centre. I used basting spray to baste and that held very well. Maybe some extra basting pins if you’re worried about puckers? 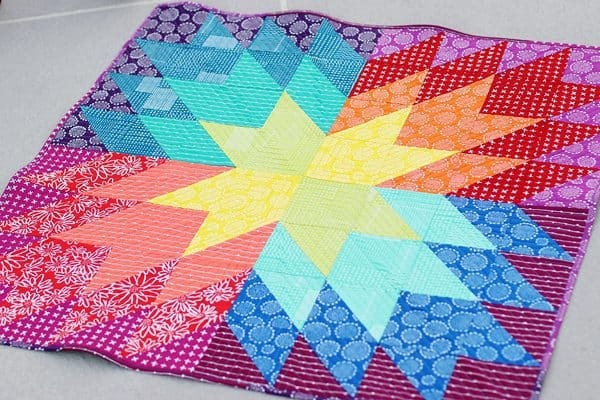 Beautiful quilt – love the rainbow of colours! oh, the timing could not be better. I was browsing around for inspiration because I want to make a quick baby quilt for my neice whose baby is due in six weeks. Perfect!! Thank you Kristy. This is a great pattern. And those fabrics look yummy. Thanks for sharing! I love this pattern and confirmed my email address last Tuesday but have not received the pattern. I have checked my files but don’t see it there either. Any ideas? Hi Margaret – as soon as you clicked the confirm button in that email, the file downloaded to your computer automatically (it doesn’t come in a further email). The file is called When You Wish, so if you search for that in your file manager it should come up (and then you’ll be able to see where your computer likes to stash these downloads, as sometimes it can be difficult to find them!). Let me know how you go! 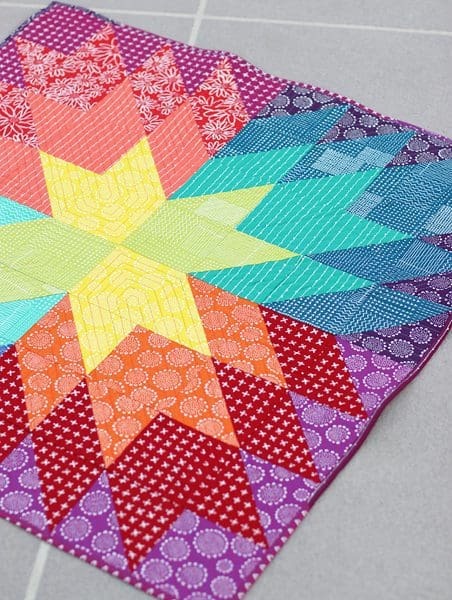 This little baby quilt is absolutely beautiful! I love it…and I love the way you quilted it. One of my husband’s co-workers is having a little bundle of joy soon so I will be making one of these for her. Thank you so much for sharing your pattern…I really appreciate your generosity and creativity! Wonderful, I’m so glad it’s come at a helpful time for you! Happy sewing! 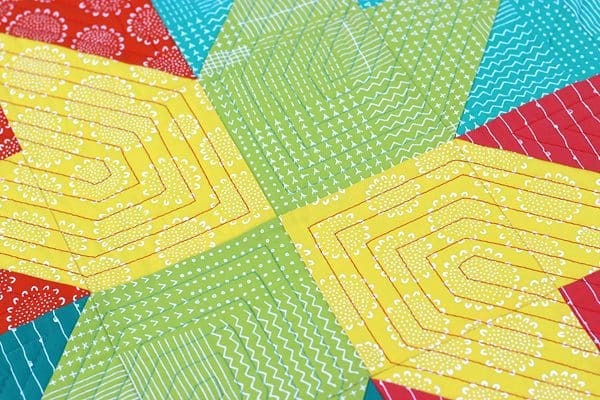 Is there any way I could get this pattern but for a lap quilt? Hiya Paige – this is the only version of the pattern I have made. 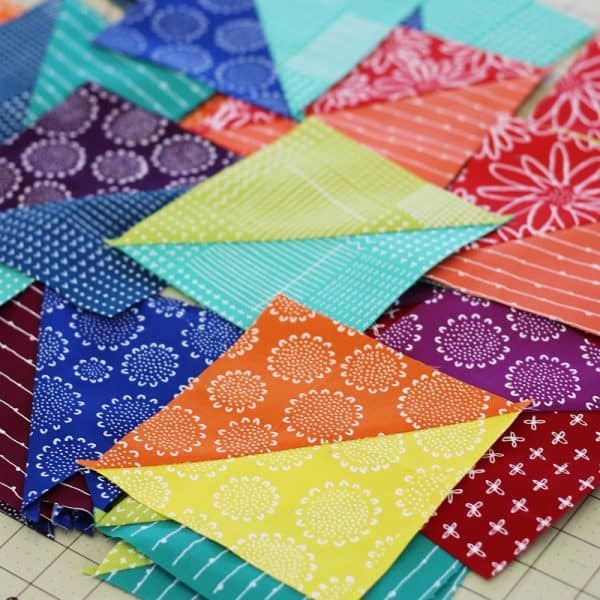 You can easily size it up for yourself, by using larger HSTs and squares. Then you can make it exactly the size you want! I have checked both spam and downloads folders and have not received the pattern. Thanks. 🙂 Never mind please – I found it!!!!! This is an adorable quilt! Would you mind telling me what kind of batting would you recommend for a baby quilt that would keep it soft with all the quilting? Thank you for designing and sharing such a wonderful pattern. And sharing it for no cost is deeply appreciated! I just use cotton batting – nothing unusual. The quilting does give the mat some body, so you could always reduce the density of your lines if you’d like a “floppier” quilt. A higher loft, polyester batting could work well here too. I don’t like poly in bed quilts as I feel they don’t breathe so well, but for a baby mat that’s not really a problem. Another option would be to use two layers of batting (I’ve never done this myself, but I know others who have when they want a poofier quilt). I have tried and tried to confirm my email but the page never loads, it just times out. How can I get this beautiful pattern? Hi Mary Lynn, sorry you’re having troubles! The way the automatic pattern delivery works is once you pop in your email address, it sends you an email with a confirm button in it. Once you click the button it automatically downloads the pattern to your computer – there’s no additional link to click or email to receive. I’ve checked the software and can see your address in there, and it’s registered that you’ve clicked the confirm button, so the pattern should have downloaded to your computer. The sometimes tricky part is knowing where! Where your computer stores downloaded files is set by the computer user so I can’t tell you that.. for instance, I have a Mac and it has a special ‘downloads’ folder where it automatically puts any files downloaded from the internet. I love your quilt. I’ve been hoarding my Blueberry Park fabric waiting for the perfect project! Thanks so much for the quilting diagram I am a newbie and still struggle with the “Quilt as desired”. Can’t wait to make the quilt. Oh My Word! That is divine. The colours you have used are stunning. I hope I can choose my colours that well. Thanks for sharing the pattern. So generous of you to offer this beautiful quilt pattern to all of us for free. Thank you! I have been looking for a pattern to use for the top of my dining room table. I have used simple squares in the past but this will be perfect. Thank you. Wow! I am super impressed with your deft hand with the colors and prints!!! Bold and bright, powerful colorful prints — any one (or more) of them could have EASILY overpowered, disappeared, or otherwise thrown the whole thing off. Instead, it’s so well balanced, so well done. I am happily blown away, ‘been looking & looking at it for many happy minutes now. Thank you so much. I was very happy with how it turned out and I hope the pattern will be useful for others. Thank you so much for sharing your beautiful pattern. Your quilt was absolutely magnificent!! 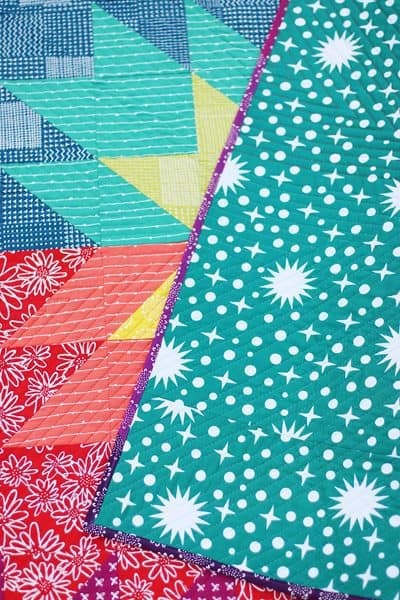 I can’t seem to buy this lovely bundle of fat quarters anywhere, all the quilting websites say it’s not available, and their actual website says it does not sell to other than businesses. I’ve subscribed and confirmed through the email link that was sent to me, but I still have not received the pattern. Hi Angel, I’m sorry you’re having trouble getting the pattern. When you click the confirm button the pattern will download to your computer automatically. Sometimes it opens straight away and you can save it, other times your computer stashes it away in a “Downloads” folder. If you go to your file directory and search for When You Wish, the PDF should come up. I really like this quilt and it looks not too hard for a beginner like me. However, I also have a problem downloading it. I have tried to download it multiple times and it didn’t work. I checked my computer for it and it is not there. I just wonder if it is still available. Thank you so much! 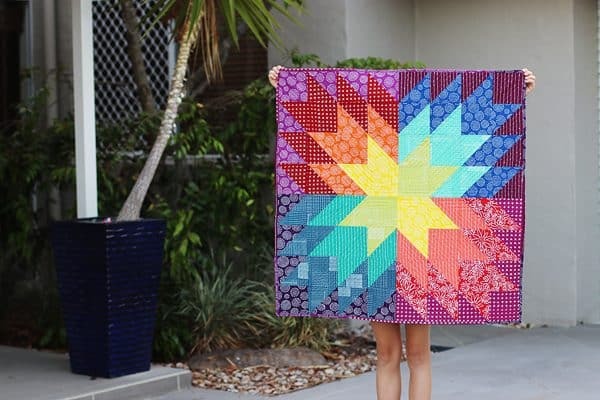 I love this quilt pattern! I have 4 grands and can see this being a good one to get me started on making a memory for one of them! So wonderful!!! Thank you, Kirsty. I cannot find the pattern in my inboxe, junk mail, or spam filter. Sorry you’re having troubles. I went into the software that delivers the pattern and it’s saying that the confirmation email to you bounced. Is it possible your email account is full, or that you used the wrong email address? Just wanted to tell you that my pattern showed up in my Download folder without an email, or having to download the PDF file. That’s a bit disturbing, but at least I got the pattern. Personally, I’d rather have to manually download a file for security reasons. Anyhow – love the pattern – Thanks! Hi Carole, I think that might be how your Download preferences are set up in your browser? You can go into the Preferences of your browser and set where you want files to be downloaded and whether you get a “should I download this” message before it happens. That way you can set your computer to ask you each time about a download and you can screen it if you’re worried about security. Hi Kirsty, thanks so much for this pattern! I’ve made two quilts using it, and adapted it for each one. The first was for the arrival of a friend’s baby, and I embroidered his birth details on it. She loved it and was showing it off to everyone! The second I adapted to make a queen-sized quilt for my godmother’s 60th with some beautiful Japanese-inspired fabric from a Robert Kauffman. I kept this one in blues and golds, which are her fave colours. Thanks Glenda, so glad you like it! Happy sewing (would love to see it when you’re done). I love the look of this quilt. But I haven’t been able to get the system to send it to my email address. I have received others but for some reason this one just isn’t coming through. I am really disappointed. But I guess that’s life. Hopefully I will see it again and be able to get it then. No pattern? Not on my watch, Jori 🙂 I’ve emailed it directly to you. Hi Kirsty – thought I’d share regarding the wavy binding issue – I have stopped doing a close zigzag or any other fancy stitch on edges, because, as they look interesting, they seem to s-t-r-e-t-c-h those edges, and I now stick with straight stitching, or very narrow, but longish, zigzag. Also, I disengage my walking foot for edge work as that seems to help in keeping the stitching (and edge) “tight”. Thank you, Margaret – we appreciate the tip! I’ll try a shallower stitch next time I’m zigzag a binding. I can’t get the pattern to download – it didn’t download automatically and there is no link. Please help. I only do stitch in the ditch and want to be more creative this helps . Cannot get the pattern to down load. I love this want to make for a new baby coming. Can you email it to me? Thank you for the pattern, I had no trouble downloading it. I love it for baby quilts and seasonal wallhangings too. I appreciate your offering it for free! Thank you for the pattern, I have shared your website with my online quilt group, Canada Stitches. Our current on going project is to provide quilts for Ronald MacDonald House in Red Deer Alberta..I hope by sharing your information for members to download their own copy that it will inspire a few of them to contribute to this project. Thanks for helping me to inspire them! Thank you, Gail – I hope this pattern will be useful for them and that they enjoy reading a new blog. Good luck with your online group! I have been trying to get this pattern without success. Looked every where. Did file searches. Had my husband look also…as he is our guru in cases like this. No where to be found. HELP please. I would also like a copy of this pattern please! It’s really bright, cheery and fun! Love the quilt. BTW – Tish is from my hometown. I haven’t met her. My 50th class reunion is this year. She is a friend of my cousin who graduated with me. So, IF I do go to the reunion, I plan to meet her. Small, eh? Oh, I love happy coincidences like this! It really is a small world! A beautiful quilt !! I love the first picture with the lovely legs floating in mid-air. I looks like someone is being pulled up into the stars. This looks like a fabulous pattern that I’d really like to try for my brother and sister-in-law’s child-to-be. I tried to join the mailing list but nothing came up in my email or in my junk. Is the pattern still available?